View of an Mbuti hunting camp in the forest. Sarah, not yet three years old, needed a responsible companion. We first tried a local Mundaka girl, Annie. She was 18, not married and mainly interested in the young park guards strutting around the station. Sarah only wanted to be in the smokey kitchen with Basisionoko and Kachalewa. We tried a Mubudu girl, Andea, recommended by the priest in Mambasa, 70 km down the road. She lived in a room by the kitchen, but Sarah’s main caretakers remained the men in the kitchen. After a couple of months and probable pregnancy by one of the station guards, we returned Andea to Mambasa. Kenge recommended Sofi, a single Mbuti woman, as replacement for Andea. Sarah was won over immediately. Sofi gave Sarah her full attention and yet was quick to learn what John and I wanted. Not more than four and a half feet tall, she had a winning half-smile like a permanent light on her face. No matter the slightly “tarnished” reputation after a series of liaisons including one with a village man, Sofi had no pretenses, but also did not spend the day in girlish flirtations. When we were back and dusk approached, she’d catch Sarah in her arms, Sarah already almost half her size, they would share some private joke; then she’d flick us a hesitant smile, break into laughter and run up towards the village. We started a garden at the end of February, partly because Kenge insisted we needed one, but mainly to understand better the main cause of deforestation and the origin of all the various stages of tree regrowth that proliferate along the road. Kenge took credit for finding jobs for all the Mbuti who started work cutting dense secondary growth, burning and then planting. Often Kenge and I would end our morning walks by stopping to chat in the garden. On such occasions I was the Turnbull replacement, the American researcher dependent on Kenge and giving him a special status. Once, though, the garden crew managed to make a fool of him. It was before I understood the full extent of Kenge’s alcohol problem. That morning, Kenge took a different route to the forest edge; he led me round the back of the guards’ camp, up to a thatch kitchen area. “Hodi, hodi”, he called as he ambled across the packed earth. A woman looked up from the cassava leaves she was pounding in a large wooden mortar. “Uniletea verre moja…give me one glass, and one for mama, too,” he ordered, giving me the look of mixed defiance and collusion that I came to associate with an impending bout of drinking. The woman went into the dark, bringing back a beer bottle corked with a leaf wad. By the time I understood that this was local kindingi and had refused any for myself, Kenge had already downed a full tin mug. “Who’s going to pay?” the woman wanted to know. “MamaSala”, Kenge confidently jerked his chin in my direction. I started to deny that Sarah’s Mom had any intention of paying, but Kenge pulled me away and we were down the path to the forest. 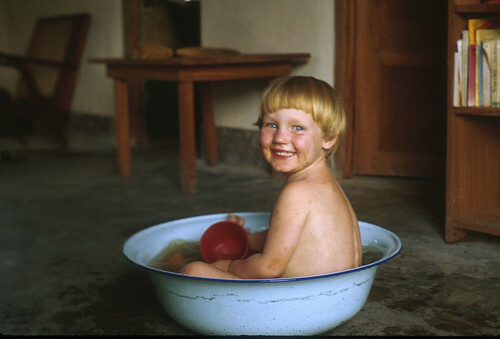 Sarah (locally Sala) having a bath at home in Epulu. It was not a good morning. Kenge’s tongue was thick and he was all digression and exaggerated solicitude. I called off the morning tree-walk and we headed to the garden. There Kenge began to brag about the important work he was doing with me and generally got in the way of the ten Mbuti and the villager who directed the final clearing before planting. They continued to swing their mundus (locally forged, small curved machetes). Jean-Marie, the villager, turned up his radio. “And MamaSala says Murefu [Turnbull] is going to come back to visit me and bring me new clothes and a radio,” Kenge announced, leaning against an uncut tree. I had said no such thing. Michel, Kenge’s brother-in-law, had had enough. “Yes, we heard about that,” he said pausing in his work. “Haki, truly?” Kenge asked, taking a moment to focus in the direction of the speaker. “It was on the radio; they kept repeating it all morning,” Michel went on, stretching his back with a bend first to one side and then to the other. “Ndyio,” Kenge began to puff up. “All morning”, he repeated with pride. “They said that Murefu wrote Kenge a letter and was going to come and get him. Take him back to Ulaya [Europe].” “Kabisa,” Kenge exclaimed, totally credulous. Michel pushed a bit further and then broke out in laughter, joined by Jean-Marie and the others. Kenge’s eyes filled with confusion, soon replaced by opaque anger, an anger that became too familiar in subsequent years. I understood why Kenge’s village camp was so small. Only the close of kin would tolerate his drunken cockiness and choler. 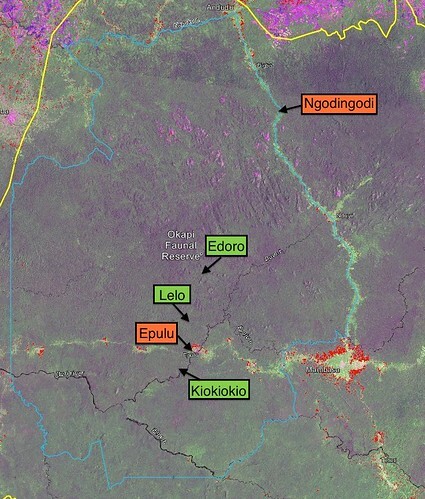 A few Epulu Mbuti hunting camp locations in green. Ngodingodi was the camp of the Harvard anthropoligists in the northern Ituri. The straight line distance between Epulu and Mamabsa in the east (crossroads) is just over 50km. For Colin Turnbull the village with its ring of gardens was a degraded environment, a recent blight. His vision of the Mbuti was as an integral, timeless part of the forest itself….far from kindingi. Kenge organized our first family trip into the forest. Kiokiokio was an Mbuti camp-site near mbau forest, the forest type I wanted to study where all the large trees were a single species (Gilbertiodendron dewevrei). Kiokiokio was about seven km away and from Kenge’s description, the mbau forest covered more than a hectare. 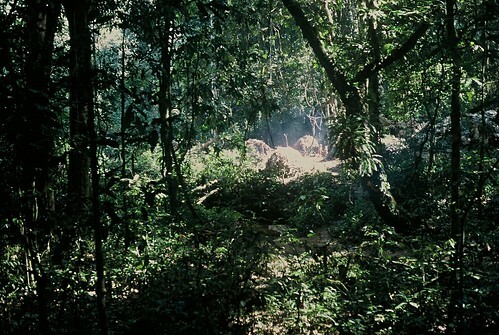 Closer to Epulu, mbau occurred only as small patches in endless mixed forest. Kenge spread the word even before we had decided that we would all move out to the forest. There are a number of “village” Mbuti settlements spread around the perimeter of Epulu’s gardens. Any Mbuti will claim one or the other as “his” camp, and most of these never completely empty out even during prime hunting periods. These “village” camps are built for the most part like forest camps, a small group of round shelter-like endus, built in an hour or less, and looking temporary. The trip to Kiokiokio quickly expanded. Makubasi decided to come with a group of families from his camp and so did Umudi with another group from his camp. Our little research trip became a hunting trip. John was delighted; that meant we could alternate days working in mbau forest with days following the hunt and he would get more information about the distribution and diet of duikers (forest antelope). It wasn’t until the hottest part of the day, that we started the walk to Kiokiokio. The forest shade was calming. John and I took turns, one of us carrying Sarah in an Mbuti-style side sling while the other carried our books, clothing and research materials in a spacious canvas backpack. Sofi and her friend, Asha, each carried a mwembo, or large basket on a bark tumpline, filled with food for the Kenge family and for ourselves. Asha was the wife of Kenge’s younger brother Abeli. She was strong, animated and had no encumbering reticence. Locally she was one of the most outspoken Mbuti women, dangerously so after a bit of kindingi liquor. Quickly flared anger would send her loud and shrill into the very center of any gathering. She pounded her feet, tore her hair and sometimes shed her clothes. She was missing front teeth and so was her husband Abeli. Nevertheless, the two of them seemed the most care-free and idyllic Mbuti couple when sitting against each other, straight-legged, in front of their endu, rolling dried liana fiber into twine for their hunting net. We followed the path downstream. At times the voice of the Epulu river was lost in the cicada-buzz and bird song of the forest, sometimes the path curved close enough for us to hear the roar of rapids but see nothing, and sometimes the path broke from the trees onto a bank where the river was silent, its back smooth to the opposite shore where trees seemed small, their branches bouncing under the weight of barely visible De Brazza’s monkeys. This was farther than either Sarah or I had ever come away from the road. I was more impressed than Sarah. We kept her busy by passing her the large rubbery flowers of Parkia to pull apart, or a piece of rock-like aromatic sap that we broke off the side of an mbeli (Canarium) tree, or just packets of assorted leaves that had been thrown to the ground by primates. John and I picked up our perpetual conversation: how to follow the hunt, identify duiker foods, keep a plant collection, use local names for plants, and on and on, until Sarah changed the subject with a question or comment, or we caught up with Atoka, Kenge’s eldest son, whose family was just ahead of us. John slipped into an easy Swahili chatter. Atoka had rambling tales of heightened detail about non-Mbuti women. There was Françoise, the prostitute from Kisangani. “Eeyla, Atoka,” Atoka’s voice slid up an octave in coy imitation, full of innuendo. Hardly slowing his pace Atoka managed a couple steps of exaggerated hip movement, his own hunting net never losing its position on his head. When we arrived at the Kiokiokio clearing Mbuti already lounged in small groups around fires. The thickets of Marantaceae leaves and small saplings had been cut away defining the campsite as a rough oval surrounded by uniform tall forest. People were eating bits of roasted manioc or putting mangongo on half-built endus. Given the relaxed pace, it was clear that leaves over their heads tonight was not everyone’s priority…though I was hoping that we would have a roof. Sarah joined the small group of children searching for crabs in the rocky stream bed. I need not have worried. Asha and Sofi went off to cut mangongo leaves. Atoka, Tshukiza and Kenge cut us flexible stems for a framework. Safenia, Kenge’s wife, took charge of the construction. Sofi joined her to put the leaves over the wicker as the late afternoon sun slipped from the clearing. Sarah and Madeline preparing mangongo leaves for thatch. People congregated around family fires, which now burned through evening shadows. Briefly the upper branches of a kangba tree were canonized as the retreating sunlight, turned golden, receded up the eastern wall of the clearing. The day-time buzz of cicadas was replaced by the many-voiced evening katydids, and as the last light of the sun was extinguished, a sudden loud chorus of bats joined from some undefined region. Their excited honking filled the forest. The camp was named after this lek, or male courtship arena, of hammer-headed bats. A nasal “Kio-kio-kio-kio” echoed endlessly through the night. The voices were the voices of males, all together calling to their snout-nosed consorts, who would each choose one from the myriad strident male voices. They were fruit-eaters, social, and I was amazed by their size when a child proudly brought one back dead. It had a wingspan nearly as great as Sarah’s height and its thickly furred body exceeded the length of my two hands that cupped it. Rather than the little flat face dominated by out-size ears that I thought of as belonging to all bats, this one had large eyes and a muzzle like a dog. We were soon into the rhythm of spending a day in the mbau forest, cataloguing Kibila names for plants and making collections, followed by a day with the hunt. Sarah seemed happier than she had ever been when left in Epulu. John and I would hug her each morning, but before we had even gotten started down the trail, she would be off helping Safenia wash pots or watching Matama pick lice from Nyamisi’s hair. Wife checking husband’s head for lice in hunting camp. It was also Sarah who solved the problem of bad hunting luck. Neither Tshukiza’s nor Kenge’s net caught anything the first few days out at Kiokiokio. The women were the first to be blamed. Perhaps they had accompanied the hunt while menstruating. This was less than likely as Safenia had stayed in camp with Sarah and Fatuma, Tshukiza’s wife, was pregnant. In any case, Safenia and Fatuma, without much of a show of contrition, cut their tongues and spit blood on the nets. Safenia called out the names of all potential game animals. Tshukiza hung the nets under which he burned little packets of dawa, leaves thought capable of curing the problem. Nevertheless, that day their nets came back empty again. The next morning Safenia took up a wooden bugali spoon and started beating Kenge’s net. “What is this? You don’t kill animals? Where is the sundura, mboloko, nge, kuva…? Sarah thought it was great fun. She took the wooden paddle and went at it with vigor. Safenia stood by calling out “Mboloko, kuva, seke…” Tshukiza brought his net over for the same treatment. Sarah beat it with two-year-old vigor. That day John, Kenge and I were in the mbau forest. Soon after we got back the hunt came in. Tshukiza had caught an nge and Kenge’s net had caught an mboloko. Sarah was as proud as Safenia who was certain that it was all Sarah’s doing. Sometimes Kenge just tried to get me to see a hive. Usually without success. “There’s honey in that mbi. Do you see it MamaSala?” “No, I don’t.” “Come here. Now look where that branch comes off. Do you see the bees?” “No, I don’t.” “Basi, come, follow my arm. See the bees flying in and out?” “Maybe.” But almost surely I did not. He showed me the tree next to which Mulanga’s father had speared an elephant, and he showed me where elephants rubbed their backs against a large leaning tafa tree. Each tree with a story became a landmark, and the forest was filled with them. It was a revelation, however, to see how many trees as far away as Kiokiokio were still individually familiar to Kenge. Even after going four or five times to our plot in mbau forest, I could not have led the way from Kiokiokio camp. It was, at most, a twenty-minute walk. Our path was familiar: here we ducked under a fallen trunk, here we clambered over another, here at the nearly horizontal tree, we waded across a stream and Kenge had bent a sapling to mark the way here and here and here. But for me it was like the familiarity of isolated faces in an anonymous crowd, whereas for Kenge, the whole area, with its trees and lianas, had the familiarity of a family home. It was a house forever under construction, trees fell, there was regrowth, elephants transformed a flooded clearing into a broad wallow and then abandoned it, but somehow the map was easily modified for Kenge and absolutely confused for me. Turnbull’s own helplessness in the forest determined his relationship to the Mbuti. So often he only knew where to walk because of the Mbuti in front of him who strode from elephant trail to stream to elephant trail without the least hesitation. For Turnbull this was a unique Mbuti gift; he stumbled along as quickly as possible often bent over nearly double to avoid fallen liana tangles and leaning trees. Over time we actually found quite a few villagers, Bila or Ndaka, who had the same accurate sense of direction over large areas of forest. They would leave the trail to collect a certain root, and then continue looking for lianas to tie house poles together, or the bark of a certain medicinal tree, and then they took off in an entirely unexpected direction arriving home without reference to blazes or a pause to reconnoiter. We created our own point of familiarity. Everyday that we were at the Kiokiokio mbau forest, we made a little fire to brew coffee, always at the same place, just above a stream. We sat on the exposed roots of an mbeli tree that seemed to hold up the edge of a rise in the forest floor. The principal roots of mbeli, each as thick as the trunk of most canopy trees, wound out from the massive straight bole. Kenge cleared away mbau leaves for the bed of the fire. Our feet were buried in the same large slow-to-decompose leaves, the never failing mark of mbau forest. Trunks of mbau were visible as far as we could see in all directions, their finely peeling bark like layered gold leaf. We clasped our coffee, our fingernails blackened, and our pant legs muddy, stiff and frayed around the ankles. It was in this charmed corner of forest that Kenge introduced us to the delicate flavor of leaf-wrapped and roasted giant snail and where we reviewed together the hunts of previous days, including the killing of the first okapi I had ever seen. Yet, special as this place was, in the years that followed, more than once we walked past the very site and I only recognized it after Kenge made the comment, “Remember when we drank coffee here?”. Then I saw the huge mbeli tree towering over the mbau trees and knew that he was right. Eventually I learned how temporary Mbuti camps were. A site that was used again and again might suddenly and definitively be abandoned because of a death; impossible to live under the same trees without remembering a person who recently died at the site. The Lelo stream north of Epulu had a number of former campsites along its banks. Once, when Kenge and I were examining a flowering stand of mbau along the Lelo’s banks, Kenge stopped in a small opening of dense Marantaceae. He darted off in one direction and started ferreting noisily through the tall undergrowth. “Iko happa; Kuja angalia. Here it is; Come see,” he called out with satisfaction. I followed his path through the dense stems. “Look,” he pointed with pride to a shallow hole, with marantaceous rhizomes growing from the collapsed sides and with dead leaves on the bottom. “That was Murefu’s outhouse.” I was amazed. So this had been a camp in the 1950s. Turnbull stayed here. And, for goodness sake, he had an outhouse. That had been the colonial era; Turnbull stayed with Patrick and Anne Putnam who, for all their simplicity, had patrician New England backgrounds. We were a quarter of a century later and we came with a background of camping in America’s wilderness. It never even occurred to us to relieve ourselves anywhere but in the open forest, as the Mbuti did. Sarah in camp with Safenia. At Kiokiokio, after following the hunt all day, back in camp, we had the rumen contents of all the netted animals to clean and sort. We squatted on the edge of the stream emptying the contents of the entire digestive system of each animal, rumen, reticulum, omasem, abomasem, into a plastic bag. It was reminiscent of farmers who emptied the guts of cattle for the making tripe but we gave the tripe back to the hunter who had caught the animal. We, then, poured the gut contents through sieves. The tripe was prized meat and the Mbuti would carefully clean it by our side, watching with much amusement our equally careful sorting of the erstwhile gut contents. John and I pulled fruit pieces from the digestive soup, weighed the factions, and re-bagged selected bits for future identification. Soon after dark we bathed just upstream, ate the delicious meal of duiker and rice that Safenia or Sofi had cooked for us and found it nearly impossible to stay awake. I took Sarah for one last pee between the trees; then she crawled into the endu, shed her shirt and curled into a kikwembi. Soon afterwards, John crawled over her to collapse into a curbed mound asleep against the far side of the endu. I lay on the other side, tending a low fire at the entrance. How was it that the Mbuti sometimes stayed awake so much longer, singing or telling stories? Honey season was starting; excitement was high. Sometimes sitting at the entrance to our endu with a low-burning kerosene lamp, I managed to write notes and listen to the singing, well after the sounds of small children had been lost to sleep. One night the camp called out the baketi (forest spirits) with honey songs. How I wished John was still awake. It is a special way of singing when the baketi are called out. All the fires are put out. First just the women sang, marking time with clapping sticks, then men joined in. At the central barazza men and women sat closely intertwined. The excitement was tangible. Voices joined in from farther away where people sat next to damped-down evening fires. Safenia extinguished my kerosene lamp. Even the barazza fire had been reduced to embers. The camp seemed to become pure sound, all other senses subordinated. The song swelled; each voice savored each note, and flowed into an ever-changing harmony; the forest became music and there was nothing else. I narrowed my eyes struggling to see, but sight was impossible. I could only hear an increasing tempo from within camp, and from just beyond camp a loud crashing, shrill whistles from one direction then from another. Always the singing continued: constant as a heartbeat reassuring as the forest itself. Indistinctly a figure materialized briefly from darkness. I squinted, thought I could see a few waving luminescent strands (fungal mycelia? ), but it disappeared. Feet rhythmically pounded the ground. Then the phantom reappeared. One or several? Very close, gyrating, stamping and gone again. It was part of the song, loud now, harmonious, all voices joined and yet each note remained clear, distinct. The end was sudden. Shouting a few more shrill whistles. People left the barazza, a few to run behind the houses. Then the singing continued, women only, quieter. Masuli stood up and stretched, “Inakwisha. It is finished”. The next day I was told that the baketi whipped one of the lads, Sefu, behind the houses. I never did learn why. For spirits the baketi seem mischievous. John told me how once, when with the Mbuti in the southern Ituri, he got lost returning to camp alone. Perhaps he was watching birds or perhaps he left the village a half hour too late. John, insouciant and ever confident, might well have done either or both. The path seemed obvious; how could darkness obscure his direction? But suddenly he was lost. His flashlight, being dim, was useless. He peered every which way, imagining openings that could be paths. Thinking that he could discern the path in one direction, he walked a short distance. It was clearly wrong. He tried to retrace his steps. Finally, he slept under a tree. The next morning he found his way easily. Joining the Mbuti preparing for the morning hunt, he rather sheepishly explained what happened. They laughed and told him the baketi had tricked him. Although very interested in what reached beyond the rational, Turnbull wrote mainly about the molimo, also known as eshumba, not about the baketi. The molimo was kept by the men and called forth through a men’s society. It was actively called to participate on a variety of occasions: for death but also for lesser ills or imposing dreams, anything that perturbed “normal” life. The baketi were less intentional, and often were present without having been called. They belonged to the forest not to the camps. They were as much female as they were male. It was in December, 1973, that John first came close to the molimo usually called eshumba in the south. It was four months after the death of one of the men in the band; the eshumba was needed to mark the end of mourning and to revitalize the camp. “ On Dec. 23, after weeks of talking about the move we left our forest camp and returned to Masange. That same night was the beginning of a 10 day eshumba. ‘No, no John,’ several of the older men said, ‘You watch empty tonight.’ I heard other comments on how easily my skin would be burned or that I would not be quick enough to dodge the flying faggots. …. My second night with eshumba was far different. I met Manguli, the eshumba of a nearby band of BaMbuti. …With Manguli there was song. Starting at dusk and continuing to nearly midnight the young men and Manguli sang nearly non-stop. I too learned the eshumba songs and even soloed when my turn came. All of us sat together, touching arms, legs, backs, hands, hearing and feeling each other’s harmony…. I have never felt closer to the BaMbuti. I slept two nights with the other young men in Manguli’s house, listening to the jokes and stories, joining in the song. John’s account of the eshumba of the Southern Ituri did not even mention women. He became one of the men. Turnbull, also, was among the Mbuti as a young man. Being let into the secrets, male secrets, was important to him. Being included in the exuberant, uninhibited, clutch of the young bachelors was part of Turnbull’s joy among the Mbuti. Knowing the perceptiveness and responsiveness of Kenge, I would not be surprised if Turnbull’s appreciation of the molimo (or eshumba) society influenced how often the molimo was called forth and perhaps how long it stayed among the men. What exactly the molimo, or eshumba was, varied from region to region, even camp to camp. Turnbull, thought it to be fundamentally different from traditional village practices but they, too, have a molimo-based male “religious” society. In the central Ituri as in the southern Ituri, what remained constant, for villagers and Mbuti alike, was that women could not see the molimo. Although among the Mbuti the women’s song could be essential to the camp’s mood and thus to the molimo’s success, men ostensibly controlled the spirit’s entrance and exit. Sometimes, the fact that the molimo was controlled by men, gave it a special sexual role. Not when the molimo was called out after a death but when it participated in the celebrations before marriage, it could take on a clearly heterosexual male persona. Turnbull did not discuss this role of the molimo, apparently more comfortable with the spirituality of the communal male experience. When Musilianji, Kenge’s first daughter, was about to be married into a distant village camp, the molimo and an associated second spirit called madodo, joined festivities in a forest hunting camp. 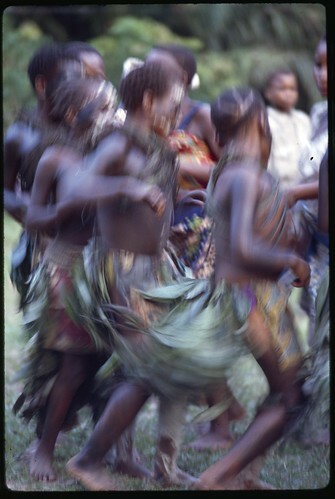 Mbuti women dancing in the Ituri. The next day again we hunted, we ate honey, we “chanjaaed” the mukila [hunting net] because little meat was caught. Again there was singing and dancing in the evening but less so. This was more than compensated for in the morning. Madodo and the molimo woke us all before dawn. Everyone gathered in the gray half-light and the singing was the strongest I’d ever heard it, the dancing the most frenzied and the most carnal. Men danced among the dancing girls, scattering them, chasing them with lewd jerks of their hips. Abeli grabbed a pot and pretended to urinate in it and then flicked his urine over the revelers. Kombe’s old mother joined him with a kikwembe [wrap around cloth worn by women] bunched up at her groin. Making like it was an erection she massaged it into the pot. All the girls shrieked and scattered as Abeli chased them with the pot. They regrouped immediately always dancing until more males descended on them, hips forward, sending them squealing. Never did Colin Turnbull describe a molimo that was so explicitly heterosexual. He celebrated its communal nature, and particularly its participation in male-solidarity. Another element of the supernatural was more disturbing, a dark element, bolozi, meaning sorcery or sorcerer. Colin associated this element only with the village. Anne Eisner Putnam, however, described a group of Mbuti as they threatened an old Mbuti woman they accused of being a sorcerer. She was responsible, they said, for the death, by dysentery, of a young hunter. The old woman was beaten and Eisner felt certain that without her intervention the woman would have been killed (Nat’l Geographic, Feb 1960, 278-302). Eisner and Turnbull were at Epulu at the same time but clearly they saw different events and perhaps interpreted the same events differently. Turnbull had formed an unshakable opinion about the nature of morality and the supernatural in the Ituri. He thought that for the Mbuti the supernatural was associated with faith and communal values; whereas, for the villager the supernatural was associated with fear and danger. Any Mbuti behavior that did not seem to fit his understanding, Tunbull considered to be an aberration associated with the growing influence of village life. Like Eisner, we found that bolozi were present menaces in the lives of the Mbuti. Perhaps their lives contained less unexplainable evil, the realm of bolozi, than that of village groups, but its presence was occasionally strong. This was the case at a forest camp when Gasito’s child was lost. We had come back from the hunt late. It had been prolonged by several stops for balongo , the honey of a certain meliponin bee; we were excited because early in the day a kuva, or bay duiker, had been caught alive, and sent into town where John was hoping to get individuals from all the species of duiker into pens for diet experiments. The kuva, because it is a large duiker, would be difficult to keep. We needed to follow to Epulu the next morning, to see to its care. John had two school-age village children from a Budu family that supplied the duikers with leaves from viazi (gray African sweet potato), morning and evening. There were also several Mbuti that brought fruits daily from forest trees. As we approached camp we heard discordant shouting. My immediate assumption was that there was a fight going on. But Kenge, who from a distance could understand what was being said, told us that a child was lost in the forest. The children’s miniature “play” endu on the edge of camp was abandoned. Sarah, who was staying close to Safenia, ran to us as soon as we came into sight. She sheltered against my damp shirt, burying herself in the pungent odor of my day in the forest. Safenia continued a loud haranguing, raising both arms in the air and pulling them down for emphasis. None of the women even knew when Gasito’s wife left camp to go fishing. She took both her sons, the youngest in a sling and the other, Ayaya, toddling along behind. She returned to camp at least an hour before we did and asked if Ayaya had returned before her. Instant pandemonium. I could just imagine the few women left in camp all speaking at once, gathering their children around them. Gasito’s wife had left the path to relieve herself, leaving Ayaya to wait. She said that she had hardly turned her head for a minute yet he was gone when she returned. The women had lost time with their uproar and then, instead of a systematic search starting at the point where he was last seen, they had gone in random directions. The men were no better. The problem was that Ayaya had a chronic ear infection. He could not hear the calls which Mbuti use as the standard form of communication across the forest. People are called to a central point between casts of the net; they are called to camp at the end of a hunt. Two people out of sight of each other but moving through the same forest area maintain constant conversational whoops and cries. The calls are musical, piercing, confident, but now they were useless. Instead of working out an efficient system to search for Ayaya, people were already talking about bolozi. “Who had eaten the child?” Gasito’s wife had come to an agreement with the bolozi. She should be tied and beaten into admitting to whom she had handed over the baby. Gasito’s wife huddled silently by their endu. The men’s search was chaotic. They were late to start and had decided that it would be futile even before leaving camp. Gasito was no help. He sat around alternately wailing and grabbing up sticks or a knife to attack his wife. Safenia and a couple other women took them away. The last cuckoo ceased to call. It was dark and it started to rain. Poor Ayaya. John would have left camp early in the morning to feed the kuva, but no one was organizing a systematic search. John left after the first search groups went out. They returned, still no Ayaya. The searchers said that it was no use. The child was gone. They drank coffee and ate ndizi (plantains). I admonished them to keep searching even as I prepared to leave. The camp we left was in a stupor. Very soon thereafter, Ayaya was found. Sarah and I had not been home half an hour when Kenge came with the good news. The bolozi accusations were dropped and soon it was generally thought that the baketi had spirited off little Ayaya and kept him safe during the rainy night. If any of Turnbull’s close informants had been women, he would have had a different vision of the Mbuti. Kenge was as much an idealist as Turnbull and was eager to support his friend’s search for understanding even if it meant allowing male romanticism about bonding and harmony with the forest to obscure other truths. I imagine that Kenge’s interpretations helped assure that some events common to everyday life found no place in The Forest People. Sometimes Kenge assumed we wanted to see the world the same way as Turnbull. This became clear our first year in the Ituri Forest when we visited the distant hunting camp of Edoro. 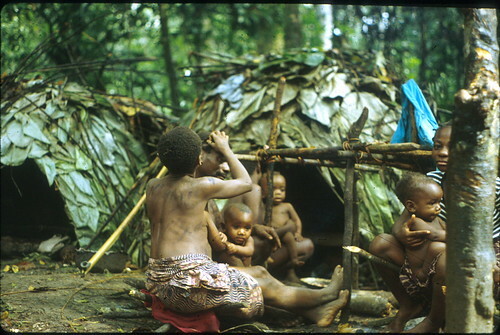 Forest camps relatively close to Epulu were visited often, such as Kiokiokio, Boukpa and Lelo. Distant camps were used only rarely. It was a full day affair to walk out to the Edoro camp, more than 20 km. Although Mbuti have few possessions, along with sleeping mats and cooking utensils, a woman would carry rice or cassava for her family and often the youngest child. The man carried the hunting net, sometimes ferrying a second child inside it. Never had we been at a camp where there was so much meat. In the first few days duikers were taken at Edoro that were rarely caught in the closer camps: nge, moimbo, seke. All the endus erected small kiharas (drying racks) in front for drying meat, and the smell of singed fur and antelope at all stages of the drying process filled camp. The forest also contained numerous tangles of kusa liana and many people were twisting the fiber to repair their nets. The youths strung a vine swing like a trapeze high in the trees just alongside camp. Sarah was spellbound by their antics, nor could I keep my eyes off the turning and flying. But it wasn’t fatigue; it was hunger that the lean protein rich meat of the antelope could not satisfy. Nor was the forest so rich in wild yams or starchy seeds that forest food could replace village food. More garden starch was needed and none of the women volunteered to make the walk out with all the meat to trade for mihogo or rice. From the usual camps such a trip could be a single day march to town and back. From Afarama it would certainly be two days, possibly three, a long day out, then the effort of selling or trading, and a long walk back, also with a heavy load. In the meantime, the people left in camp would be hungry. Instead of stating the obvious truth, Kenge obfuscated. 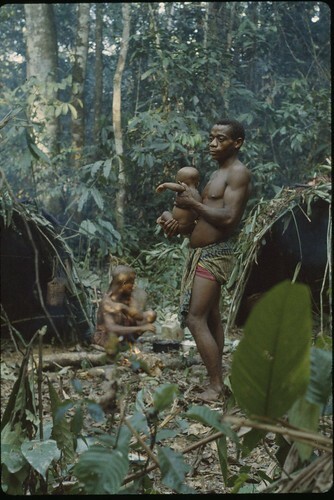 Kombe, one of the young men of our time, holding his first child in a hunting camp. “Different species of fruits, edible fungus, nuts, roots, and vegetables may flourish more abundantly at one time than another, but there is ample food of this kind at all times. 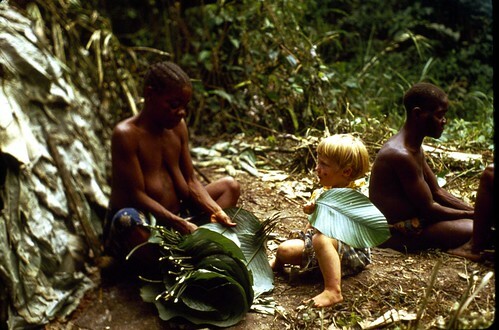 … We must think of the forest…as a place of abundance, offering a sufficiency of food and shelter, relatively free from danger… “(The Mbuti Pygmies: an ethnographic survey. Volume 50: part 3. Anthropological Papers. The American Museum of Natural History. pages 164 and 166). He considered the Mbuti to be economically self-sufficient. “Hunger in absence of village food supplies is due only to laziness…” (Wayward Servants, page 28). Clearly, for Turnbull, the dignity of the Mbuti way of life depended on the adequacy of their self-reliance, not self-reliance through trade with villagers but self-reliance through knowledge of the bounteous forest. In the southern Ituri John had been less sanguine about the forest’s benevolence to the Mbuti. “Once for two days there was no rice or manioc [cassava] in camp. The BaMbuti dispersed to look for honey and other forest foods but returned with very little. On the morning of the third day I left to look for food in the nearest village, 12 km away, about a half days walk across hilly forest. I arrived to find little food. I bought what I could and returned with a MuNande friend who carried the load. By the time we returned to camp at dusk I was almost faint with hunger. I couldn’t focus my vision, my head felt airy, I shivered although it was not cold. The BaMbuti immediately gave me a large honey comb to eat and soon I felt revived. When John and I were together, he told me of another experience that he had had with hunger. Again, there were no traders in camp and therefore no village starch. It was not honey season and the mbau nuts were not ripe. People searched during the day but came back with little. John also went out with one or another of the young men with little luck. But, as a precautionary measure John had kept some peanuts hidden in his small knapsack. Every now and again he would swallow a handful. It kept up his strength. Somehow this secret stash was discovered and John was shunned. People spoke about it out loud, with disgust. Finally he just left camp. When he later met up with camp members, however, they had forgiven, seemingly forgotten, the entire incident. Since Colin Turnbull, other anthropologists have studied the Mbuti. While we were in Epulu during the early 1980s, a small group of anthropologists 100 km north and east from Epulu were, like us, doing their PhD research. Bob Bailey and Nadine Peacock, both from Harvard, were studying the Mbuti’s (locally known as Efe) interaction with the local Lese agriculturists. The Efe Pygmies spoke Kilese, a sudanic language very different from the Kibila spoken near Epulu. And rather than hunt with nets, they used bow and arrow. However, Bob and Nadine found the forest with its animals and resources very similar to what John had seen in the southern Ituri in the 1970s and what we were finding in the central Ituri. During our first year at Epulu, curious to find out what they were discovering, the three of us, with Kenge and Safenia as well, managed to get the blue LandCruiser up to Ngodingodi, their base camp over 100 km north of Mambasa. What had been a major colonial road was eroded into a maze of impossibly deep gullies. It took two days and frequent collaboration with local village men to push the car through the road’s holes and wallows. Nadine, Bob and their colleagues had taken over a small clearing, built themselves modest mud houses and a common barazza. In the evening they discussed what they had seen during the day over shared beans and rice. We stayed late by the barrazza fire talking about hunger and the importance of hunger. We fed small sticks into the fire and adjusted the flame of the single kerosene lantern. Down the hill and around the bend village fires had long since subsided to coals. Sarah slept in my lap. When Bob made a count in March 1980, there had been 128 Efe associated with five Lese villages. It was a year of hunger. 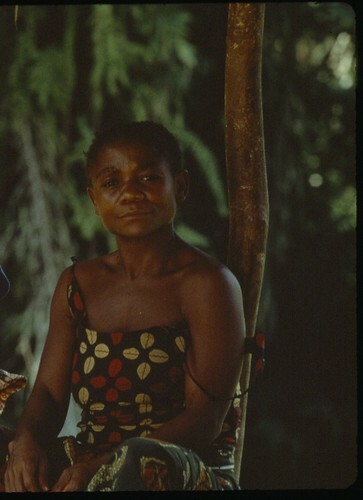 Two months later, with rice and manioc largely depleted, there were only 71 Efe Pygmies still in the area. 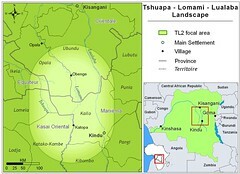 The others had dispersed to Mamvu villages to the north and Budu and Lese villages to the west. “the Efe themselves do not consider moving into the forest to depend exclusively on forest resources as a viable alternative for coping with pronounced shortages of agricultural food.” (Bailey R.C. and Peacock N.R., 1988. 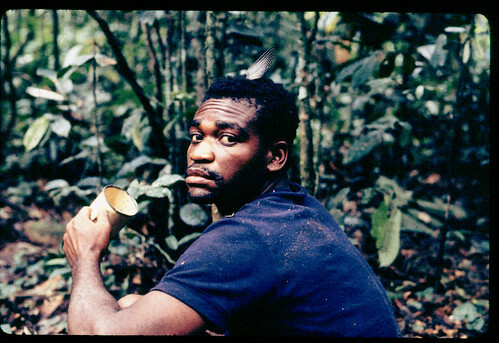 Efe Pygmies of Northeast Zaire: subsistence strategies in the Ituri Forest. chap 5 in de Garine I. and Harrison G.A., Coping with Uncertainty in Food Supply 88-115.Clarendon Press, Oxford). Turnbull did not analyze the Mbuti or their context historically, geographically and certainly not ecologically. He remained faithful to his first inspiration. It was simple and compelling. He wrote the The Lonely African but particularly The Forest People with broad, brush strokes and strong conviction. Turnbull’s visits to the Ituri Forest were all relatively short. Even the longest, 1957-58, did not cover an entire year. In any case, the story he needed to tell had become clear earlier, during the short 1954 visit just after Putnam’s death. In the early 1990s we learned of Colin’s own death. It had been nearly 25 years since he had been in the Ituri Forest. Certainly he meant nothing to the current young men, the age group he had identified with so strongly. We called Kenge and some of the older men, Makubasi, Uhmudi, and Ndakala. Colin would have a molimo. Never before had the center of the molimo actually been at our own home. We had built our house on the land where Putnam had lived as well as Colin himself. Although the molimo would sometimes dance through our garden never had its song originated at our homesite on the edge of the Epulu River. But this night the wood was brought down to the tin-roofed barazza-like garage where we parked our LandCruiser, now moved well out of the way. Several antelope were brought down, and we supplied rice. The singing started with darkness. The old men sat together close to the fire. The young men and women sat back, at least at first. All night they sang. At one time we counted over 100 Mbuti on our parcelle. Late in the night the women left, and I too went to bed. John stayed with the men by the fire. Only the men were left singing. I wished that I could describe the singing as Turnbull had. When were they singing in round form or in canon, when were they singing in parallel seconds? And how to describe the intense singing by the men late at night, mixed with the calls so like those of birds and of tree frogs. I woke up, my whole body tense and listening; John was still outside. The song was so full of life. Where was it coming from? It was no longer attached to the circle of light by the fire. It reached out across the darkened river; it reached into the stillness of the forest where only the whitest trunks would be visible in the black of night. Now in darkness, the bay duiker foraged, elephants swayed along a path, owls swooped, and the fishing genet answered from the banks of small streams. The molimo called within the clearing, it was a resonating echo by the edge of the forest; it penetrated deep through the trees, startling swarms of whitish moths. Its hollow wail filled us with remembering — remembering what we never did know. The forest was awake and listening. This entry was written by Terese Hart, posted on 2014-07-20 at 6:54 pm, filed under Ituri Story_memoire. Bookmark the permalink. Follow any comments here with the RSS feed for this post. Post a comment or leave a trackback: Trackback URL. Very interesting, Mama T! My question is about spoken language of Mbuti: do they have any vestiges of their own language? or do they really use the language of their Bakbala (Ndaka? Bila?)? What is your take on it? I’m still catching up on your entries and am enjoying them immensely! You offer an interesting perspective and I thank you for sharing your experiences. While you accuse Turnbull of interpreting events to fit his understanding it seems to me that you and John decided Turnbull must have been wrong back in 1970/1971 in the US and ever since setting foot in the Ituri were intent on discrediting him and proving him wrong. It is beyond me why during your college years you would want to have endless discussions on matters you – for the foreseeable future – couid not verify, and why you would spend your life investigating and recording the physical dimensions of trees or eating habits of animals is also beyond me, but I guess that is what drives academics. I am of the opinion however that this apparent curiosity actually is pedantic framing – bordering on OCD – which limits your open mindedness. So while Turnbull’s accounts are surely colored, they at least have nothing of the sapience that seaps through your pseudoscientific accounts. You have a very rich and deep vocabulary that paradoxically weaves a superficial web that fails to impress. All this is mostly a matter of taste however, so please don’t take offense. I do salute your efforts at conservation! I just finished reading The Forest People and am now rereading it–I love it that much. I found your website through a series of Google searches, trying to find out if the Mbuti pygmies are still able to practice their ancient traditional culture in the forest or had it been destroyed by deforestation and other destructive processes. 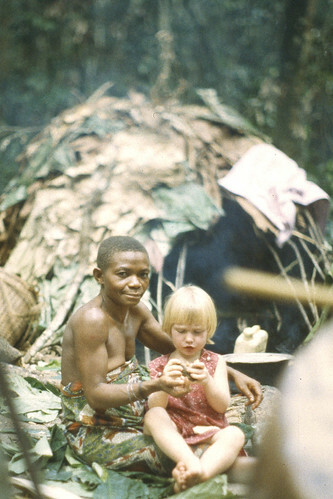 It sounds like you, John, and your daughter had an unforgettable experience living with the Pygmies. I would love to learn more about it, and I’d like to know–do you think their way of life will survive?